Rudd knows he is not like the rest of us and that’s why he works so hard to prove that he is. Whether it’s the weird way he talks or the cheesy smile he wears for those few seconds too long, or his unnatural hand gestures, Rudd is trying hard to fit in. The problem is the more Rudd tries to be like us, the less he is. When Rudd was removed in 2010, it was not just about policy mistakes, though they weighed heavily. Rudd was also removed because of his temperament, the way he governed as PM. 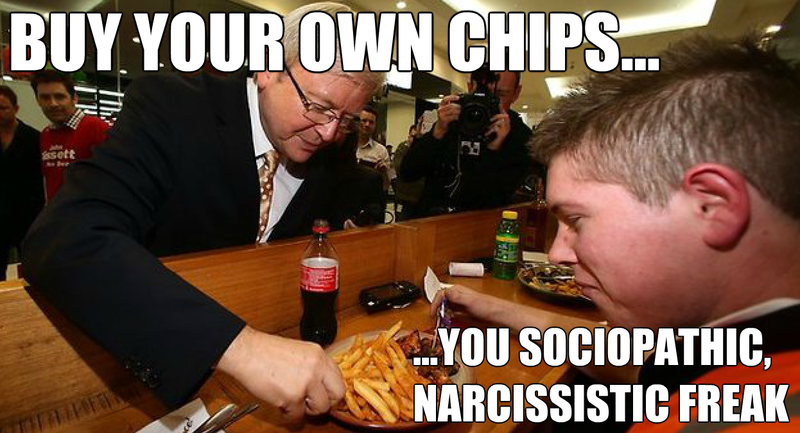 Plenty within Labor were anxious that Rudd’s disturbing personality flaws would become known to the public. There were already slips: his hissy fits, his crude language, the white anger caught on camera and the rude, dismissive treatment of colleagues. When Labor MPs spoke about the arrogance of Rudd, what Peter Beattie called his “fatal political flaw”, his dysfunctional, grandiose and chaotic governing style – it wasn’t hard to find evidence. Rudd’s character translated into rushed policies (think the National Broadband Network, the school halls, the resource super profits tax), overblown rhetoric that only highlighted under-delivery (how many policies were “revolutions”), arrogance that he always knew better (ignoring warnings about the consequences of dismantling John Howard’s immigration policy and safety concerns about pink batts) and thrilling symbolism over tangible outcomes (the apology to indigenous people was Rudd’s crowning achievement as PM). Rudd says the price of Vegemite will increase under a L/NP government. True Blue Aussies eat Australian owned and made Mightymite or Ozimite and only use foreign-owned vegemite in throwing-type sandwches. Vegemite is already 50c LESS per jar in NZ and the UK than in Australia. That price includes shipping, and 15% GST in NZ (17.5% VAT in UK). Labour are not doing anything about this price gouging on the Australian consumer by the big two supermarkets. When someone eventually writes the history of this bizarre period in Australian politics, it will all read like a peculiar, dangerous, worrying dream. Deluded and dysfunctional MPs, deluded and dysfunctional lobbyists and activists pushing wacko skewed theories, an uncritical mainstream media too lazy to ask who, what, where, when and why. Word-limited digital info rather than informative, well-researched, carefully written factual sentences. Infotainment preferred to carefully researched factual narrative. Jingle jangle rather than calm analysis and authoritative opinion. Post-modernism in full bloom, and now (hopefully) about to start dropping its petals. And dying away for good.